Many people take it upon themselves to talk to the police, even though they do not have to. These statements are used against the defendant in some very harmful ways. 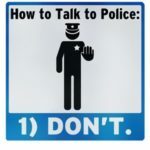 Of course, any statement made to the police can and will always be used against you (see our blog on Miranda Warnings.) Other than statements made to the police, other types of statements can and will be used against criminal defendants. In this blog, we explore the various ways in which a person’s own statements can be used against them. Jail calls are always recorded. In fact, defendants are warned at the time of making the call that this is going to happen. Nonetheless, it is alarmingly common for criminal defendants to make incredibly incriminating statements on these phone calls. They go so far as to make full blown admissions to loved ones. These calls are always monitored and recorded. They are then played at the defendant’s trial. If you are in jail, do not talk to anyone about the contents of your case. Be very, very careful about what you say. Know that these phone calls are always monitored and WILL be used against you. Anything said to your attorney cannot be used against you. But remember that all phone calls are recorded and listened to. It would probably not be wise to go into details about your case over the phone even with your attorney. It would probably be best to wait until you see him or her in person. Text messages, emails, Facebook messages, voicemails, etc. can be used against criminal defendants. They can be used in a number of ways. For one, they can be used as evidence that gives rise to probable cause to charge you. Further, they can be used against you in the negotiating phase. Finally, they can oftentimes be used against you at your trial. Even something as simple as an apology can be turned against a criminal defendant. It is important to consider what you say before you say it. Criminal defendants often feel free to make incriminating statements on their social media accounts. What is posted on social media is then seen by the world and is turned over to the prosecutors. These posts/statements are then used against the defendant in trial. If you have pending charges, you should be watching what, if anything, you say on your social media account. Sometimes it is a good idea to deactivate your account altogether. Statements that you make to anyone other than a person that falls into a privileged relationship (lawyer, doctor, spouse, therapist, etc.) can be used against you at your trial. Evidentiary rules against hearsay prohibit certain statements from being used as evidence in a court proceeding. But this does not include statements that the defendant himself made. If you have pending charges, you should consult with a criminal defense attorney and get his or her advise on whether or not you should be making certain statements. At Gilles Law, we have criminal defense lawyers licensed in both North Carolina and South Carolina.